When you think of energy, what do you think of – the Sun, gasoline or maybe electricity? All of these are forms of energy, but there are other kinds of energy too. Energy is all around you. It is the force that allows things to move and happen. Even when you’re asleep or just reading a book, your body uses energy to make your heart beat, your blood flow and your muscles move. 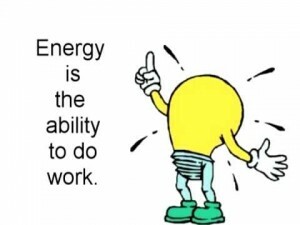 All about energy, the ability to do work. Energy can be changed from one form to another. Coal can be burned to make heat or electricity. Natural gas and wood also make heat when they burn. Think about plants. The Sun gives them energy to grow. We eat them and they give us energy. Food gives you energy. Some foods give more energy than others. Snack foods like cookies, donuts or even white bread, turn quickly to energy. Coal, oil and gas are stored in the ground. Coal and oil come from the remains of fossilized animals. 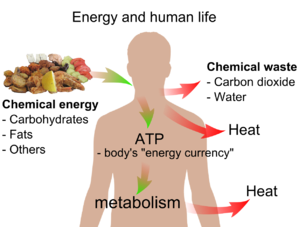 Food gives you energy. Some foods give more energy than others. Snack foods like cookies, donuts or even white bread, turn quickly to energy. Your body burns through these foods very fast. Whole-grain foods like whole-wheat bread and foods with protein like yogurt or turkey make energy that lasts longer. Gas, oil and coal will eventually run out. Scientists are working hard to find other kinds of energies. These are called alternative fuels. In our country, we have plenty of energy. Sometimes we use more than our fair share. Other people in the world don’t have the energy they need. Tell your parents to help conserve and share energy. Don’t drive a bigger car than you need. Don’t buy a bigger house than you need. 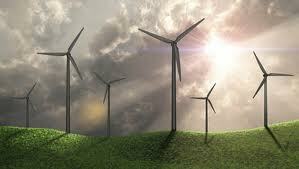 In windy areas, scientists build huge windmills. These windmills can harness the energy of wind to make electricity. Waterfalls can also be used to make power. The Sun makes solar energy. All About Energy: The sun energy is converted into electricity using solar cell panels. A video explaining the forms of energy. Question: Are there any problems with energy? Answer: Some kinds of energy like coal and gasoline cause pollution as they burn. When we use too much of these kinds of energy, the temperature of our planet rises. This is called the greenhouse effect. Question: What can I do to help? Answer: Right now, you can use energy carefully. Turn off the lights when you leave a room. Ride your bike or walk to your friend’s house or soccer practice instead of asking your mom to drive you. Enjoyed the Easy Science for Kids Website all about Energy info? Take the FREE & fun all about Energy quiz and download FREE Energy worksheet for kids. For lengthy info click here. Declan, Tobin. " Facts About Energy for Kids - Easy Science ." Easy Science for Kids, Apr 2019. Web. 25 Apr 2019. < https://easyscienceforkids.com/all-about-energy/ >.